As a general rule, I prefer to leave fisking – taking an article line by line and dismantling it – to the experts, like Larry Correia. But every so often something pops up on the internet that leaves me rolling my eyes in disbelief before putting hand to keyboard to refute it. And today there was this article: Self-Publishing: An Insult To The Written Word. I have spent much of the last year reading articles that praised Trump and damned Clinton, praised Clinton and damned Trump, praised them both, damned them both … and I can honestly say that this article is still the most ignorant thing I’ve read. If it had been written in 2008, perhaps – just perhaps – the writer might have had a point. Now … the level of ignorance is staggering. Ignorance is not, of course, a crime. But one should at least attempt to remedy one’s ignorance before starting to type. Looking at the author’s bio, I note that she has written travel books. I’ve never read them, so I have no idea if they’re any good or not. And, frankly, I have no idea if self-publishing is a viable path for travel books. I may be wrong about this, but I do question the value of her experience – such as it is – in writing about self-publishing. I am a self-published author. Indeed, by the only definition that matters – earning enough to live without a day job – I am a successful self-published author. I do not claim to be an expert on self-publishing, but I have considerable experience in the field. And most of the article’s claims are, frankly absurd. I’ve put her original work in italics and quotation marks, mine in plain text. Assuming that the book was successful in both traditional publishing and self-publishing, your friends are quite right. The problem with traditional publishing houses is that they make an investment in authors, furnishing everything from the advance, editing and cover design to promotion and publicity. (In theory – in practice, promotion is very limited unless you’re one of the big names.) They want a return on their investment, so the first profits will go to repay them. This has to be done before you see anything after the advance. And even after your book has recouped the advance, you’ll still receive only a small percentage of the profits. Would now be a good time to point out that Trump’s book – The Art of the Deal – has sold better than you and I put together? And yet, how many of those gatekeepers rejected Harry Potter? The problem here is that the gatekeepers are no better judges of what appeals to readers than politicians. Indeed, some of them are really nothing more than interns glancing over a few pages before rejecting the book. (I’ve done slush reading. Trust me – it isn’t anything like as much fun as it sounds.) Sometimes they get it right, sometimes they get it wrong. Sometimes they judge books by their content, sometimes they pick and choose for reasons that make very little sense to a normal sane person. Even if your book doesn’t fall at any of the obvious hurdles, the publisher still has only a limited number of publishing slots. Their first-rank authors (the George RR Martin types) will have first call on those slots. Your book might be rejected or delayed because they don’t have time to publish it. I’ve had books rejected by these gatekeepers that I self-published and turned into successes. I’ve also seen books published that were rejected by the reading public. (Or at least me). The system has its flaws – and they have become more and more apparent as the internet works to democratise publishing. The idea that self-published writers have not learnt their craft the hard way is insulting. Yes, there are people who put their first manuscript on Amazon Kindle and get laughed at, not without reason. But there are professionally published books that are equally as bad. If this is true – and I admit I have no reason to doubt it – I find it odd that Atwood, a hugely successful author, would need to work after retiring. In truth, I think she was having a quiet dig at his suggestion that writing was easy, compared to brain surgery. But if she didn’t earn plenty of money, this may be because of her publishing contracts, rather than anything to do with self-publishing. Atwood would make lots more money today if she self-published. There’s an episode of The Simpsons where Marge writes a book. (A soppy romantic book in-universe readers take for a reflection of her married life.) Writers loathe it. The idea that writing a manuscript is easy, followed by getting it published … <shakes head in disbelief>. This paragraph has the same problem. Yes, a brain surgeon could write a book and self-publish it. But there would be no guarantee of success, no guarantee that he could give up his day job. The idea that he could hop naturally from ‘dashing’ off a book to signing books at a bookstore is absurd. I am, as I said, a successful self-published author. But it wasn’t until the last convention I attended, a gathering of fans in my field, where I sold and signed more than seven or eight books. Most of my sales are electronic. But tell me. Do you think I would have any sales – that any author would have any sales – if the books weren’t appealing to a large number of readers? On one hand, there is a good point here. Anyone can publish on Amazon Kindle. But that doesn’t mean that there are no gatekeepers. People can and do post reviews, which help raise the book up high or bury it in the dirt. And yes, most self-publishers could benefit from a beta-reader (or ten) and an editor. But most self-publishers simply don’t have the money to afford one. And yet, the suggestion that we are an insult to the written word is insulting. Half of history’s greatest hits did not come about because someone wanted to write the Great American Novel. They happened because an author wanted to entertain people. Except you aren’t. Are you trying to distribute your CD? Are you trying to convince people to buy it? Are you singing in bars and trying to make a splash so some record executive will notice you, or putting your music on YouTube in the hopes of selling enough to live on? This is the core difference between vanity publishing and self-publishing. The former is an exercise in vanity. It matters very little to the vanity author if anyone buys his books or not -all that matters is that he has it The latter is an attempt to sell books to make money – and a splash. How many indie writers have hit it big, then drawn interest from publishing companies? Those gatekeepers you praise love finding an indie because he already has an audience. I’m a tuneless clod too. I sympathise. But it doesn’t validate you as a musician, ironically for the same reasons you defend traditional publishing. It may be nice to have, but it isn’t developing your career. The thing that does validate your work – singing or writing – is having people pay money for it. Now yes, anyone can publish a book, just as anyone can upload a video of them caterwauling into a mike while performing a silly dance. But the thing that makes the difference between a successful career and a pipe dream is the money. The great writers are not devalued by indie writers, any more than the Beatles are devalued by some half-drunk idiot trying to sing Penny Lane on karaoke night. What does devalue traditional publishing is the simple fact that many indie authors are undercutting them. It’s become a competition, all the worse because indie authors sell eBooks cheaply while traditional publishers manage to price themselves out of the market – an unforced error that is costing them sales. And instead of choosing to adapt to the new world, traditional publishers are slamming indie writers. And the people who are really hurting here are the traditional authors. They’re the ones who cannot go indie, even though they have the reader base to be successful. They are trapped. Correct me if I’m wrong, but isn’t that all that matters? Except I did spend six years learning my trade. So did every other successful indie author. You’re tarring every single self-published author with the same brush. The real difference, now, is that the mistakes are public. And yes, they can haunt writers for the rest of their lives. But really, this is sometimes true of traditionally published authors too. This is true, but sometimes the wheat gets thrown out with the chaff. Good luck trying to sell those books. You know, I agree – the art of writing is thrilling. But you know, it’s thrilling for me despite being a self-published author. But this – and all of this – really leads back to validation. And from where, we might ask, does that validation come from? There is, I will freely admit, a cachet to being published by a traditional publisher. To have someone make you an offer, to haggle over terms, to be paid an advance and watch as your book is edited, then bound and finally turned into a stack of paperbacks … that’s not something I would deny anyone. A person with a traditional publishing contract has a vote of confidence – a publisher thinks that writer can write sellable books. Because it’s all about the money, really. There is something unmistakably elitist about the traditional publishing world. And yes, going by the tiny numbers of people who have earned contracts, it is an elite. And the one thing elitists hate is the unclean commoners forcing their way into their world. The idea of self-publishers, publishers who hadn’t paid their dues, becoming successful doesn’t sit well with them. The self-publishers have a status that many in the elite do not share, even though they are traditionally published. And this has played neatly into the hands of those who want to force the genie back in the bottle. Self-publishing isn’t perfect. But to argue that we self-publishers don’t give the written word any respect is absurd. And there are so many misconceptions in this article that, in the end, it is laughably out of date. Just a little bit of background for the Bookworm sequel series. Unsurprisingly, the Summer Isle claims a glorious past. There are stories of great kings and sorcerers who unified the island and then turned it into a base for the good guys during the Necromantic Wars. Just how many of these stories are actually true is debatable. There are quite a few places – mainly in the north and east – that were touched by dark magic, but the truth has long since been lost to the shadows of history. Only the last five hundred years have been documented to any reasonable standard – and really, the Summer Isle was little more than a backwater during that time, once it was absorbed into the empire. The Court Wizards – and the empire behind them – effectively froze the island in stasis. King Edwin, the Last of the Summer Line (groan), is regarded as very weak indeed. His fits of madness – encouraged, some say, by his wife – have only intensified in the years since the Golden City’s fall. Even without it, the Crown Lands are very limited – the king’s army (and hired sorcerers/sellswords) might be able to crush one set of rebellious noblemen, but in doing so will weaken himself and unite the other noblemen behind him. In truth, the king’s writ doesn’t really run outside the largest (and most cosmopolitan) cities. The largest city on the Summer Isle is Allenstown, supposedly named for the first king of the line. It rests halfway up the Summer River. It is also closely followed by Georgetown and Robin’s Bay, both trading cities with commercial links to the rest of the empire. Allenstown is technically ruled by the king, but in truth the magnates have stolen most of the king’s authority. The other two major cities are ruled by their councils. The king does not have a heir. Queen Emetine is reported to be sterile – after being cursed during the endless aristocratic feuds – but the king cannot put her aside and take a new wife because of her powerful connections (see below). The question mark over the succession has been getting worse as the king becomes incapable of making decisions. Rumour has it that Edwin has promised the throne to King Garwood of Andalusia, if Edwin dies without heir. It is not clear if the Gathering – the assembly of noblemen – would crown a foreign prince if asked. Below the king – and outside his control – the powerful noblemen scheme and struggle for dominance. They have powerful armies and control taxation within their domains, while plotting to crush their rivals and make a bid for the throne. Indeed, the only thing that kept them in check was constant manoeuvring by the king and the threat of naked intervention by the Golden City. The most powerful noblemen are the Earls of Hereford, Goldenrod and Oxley. Hereford, probably the single most powerful nobleman in the isle, is the older brother of Queen Emetine. It was originally intended that Emetine’s child would take the throne (putting the family in control), but her failure to bear a child scuppered that plan. Now, Hereford and his family intend to claim the throne themselves after Edwin’s death. The Earl of Goldenrod is his enemy (believed to be responsible for Emetine’s sterility, among other things.) The Earl of Oxley is the weakest of the earls – he tries to steer a path between the other two. Below the earls, there are hundreds of noblemen who owe homage to their superiors and have hundreds of other aristocrats – and commoners – below them. The interlocking chains of feudal obligation are so complex that working out who owes loyalty to whom is a nightmarish task. It’s possible for a nobleman to be caught between two competing oaths and loyalties. Indeed, over the last few years, the earls have been working to sever the ties between their noblemen and the crown. Most commoners are effectively serfs or freemen – the former are not technically slaves, but there’s very little difference between slavery and serfdom. Unlike other parts of the empire, both freemen and serfs are permanently bound to the land and nobility – they cannot leave without permission. There’s no right to flee (and freedom, if one remains ahead of the bailiffs for a year and a day). Most commoners, male or female, struggle to draw a living from the land, knowing that their masters will take over half of their produce. Denied weapons or training, they have little choice. This doesn’t stop the occasional violent uprising that is brutally crushed. This is a job advert, of sorts. As some of you know, I have been determined to keep my website as simple as possible. I do appreciate the fantastic design of some sites, but they can also be a pain – the more elaborate the site, the longer it takes to load if you don’t have a great connection. Plain text downloads much quicker than huge photographs. I don’t do third-party ads and suchlike because, frankly, I find them very annoying. Basically, I’m looking for a webmaster. Someone (preferably someone who’s familiar with my work) who can design, build and maintain the website, either taking over the one I’ve got or building a new one from scratch. Ideally, someone who can make requested changes very quickly. Payment to be determined through haggling – I’ll want receipts and suchlike for tax purposes. If you’re interested in the job, please drop me an email (christopher_g_nuttallAThotmail.com) with details of your work. There is no way to hide from the fact that Independence Day: Resurgence is a very poor movie. Independence Day was fun, in a goofy sort of way. One could sit back and enjoy it if one didn’t think about it too much. (A friend of mind argued that ID4 said a great deal about the way Americans view themselves.) Resurgence, however, isn’t anything like as good, with too many problems to be believable. Even the Special FX aren’t that great. Twenty (or so) years after the first invasion was defeated, humanity has come together to build a new world – and a defence against a second invasion. However, when the second invasion begins, humanity’s defences are paper-thin and the only way to stop the aliens is a crazy plan that might just work. (Spoiler alert – it does.) Old characters pair up with new ones to defeat the aliens, rekindle their relationships and so on. ID4 worked, on a personal basis, because many of the relationships were understandable, even relatable. The movie sketched them out for us over the brief introduction before the fighting actually began. But many of the newer characters are far less sympathetic than the older ones, with backstories that come across as annoying. It says a great deal about the hopeless mishmash that the only genuine relationship that works is the (previously unmentioned) homosexual romance between Doctor Okun and someone whose name escapes me. And ID4 worked on an overall level because much of the movie flowed naturally. The aliens arrive and attack, the humans counterattack … the mistakes made by the characters are reasonable mistakes. (They didn’t know about the forcefields, hence sending the marines to get slaughtered was an unforced error.) Here, they have no such excuse. Sending a relatively small force up against an enemy known to use swarm tactics was stupid. In fact, one expects far more firepower deployed to protect Earth. Give me twenty years, alien tech and an unlimited budget and I’ll have colonies all over the solar system. The annoying thing is that there were moments of genuine interest. Apparently, there was a ground war against the aliens in Africa. Wouldn’t that have made a suitable setting for a movie? Or a ground war in America? For that matter, why not have the aliens engaged at the edge of the solar system? It would have made a better – and more believable – story. Overall, it wasn’t worth waiting twenty years to see this movie. 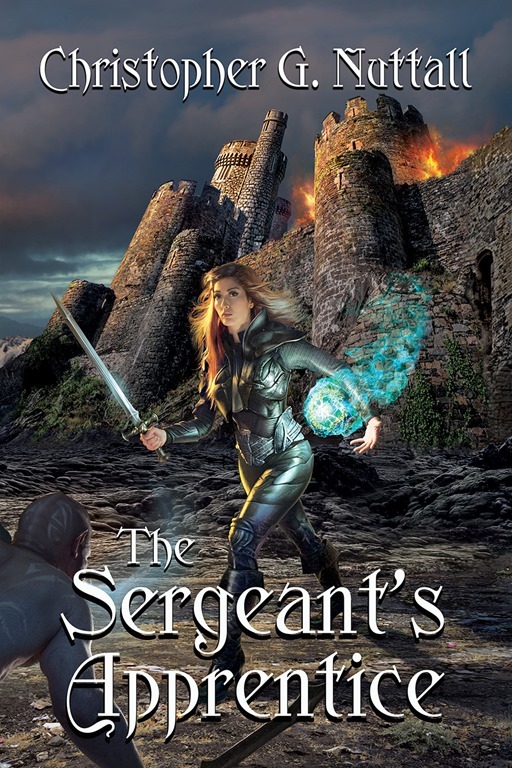 Short term, I’ve done the first set of edits for The Sergeant’s Apprentice. The manuscript is now with the second editor. There may be a third set of edits afterwards, but that depends on the publisher. I’m hoping to get the eBook out in January, but we will see. Merry Christmas – And Free Books! As a change from politics, it is my pleasure to announce that The Empire’s Corps (Book One of a thirteen book series) and Ark Royal (Book One of a eight book series) will be available free from Amazon Kindle on 24th to 26th December, 2016! If you haven’t yet downloaded these books, why not give them a try? And if you know someone who might like them, please share this post!